I love getting to photograph families like this and this was truly a special occasion. Kathy contacted me looking for a photographer in the Peoria area over Thanksgiving weekend. You see, it was going to be a pretty special gathering for the entire family. Kathy’s oldest lives in New York and hasn't been home for a couple years, and her daughter and son-in-law and grandsons (Ryan, Sarah, Jonah, and Solomon) are moving to Papua New Guinea in March to work with Pioneer Bible Translators. 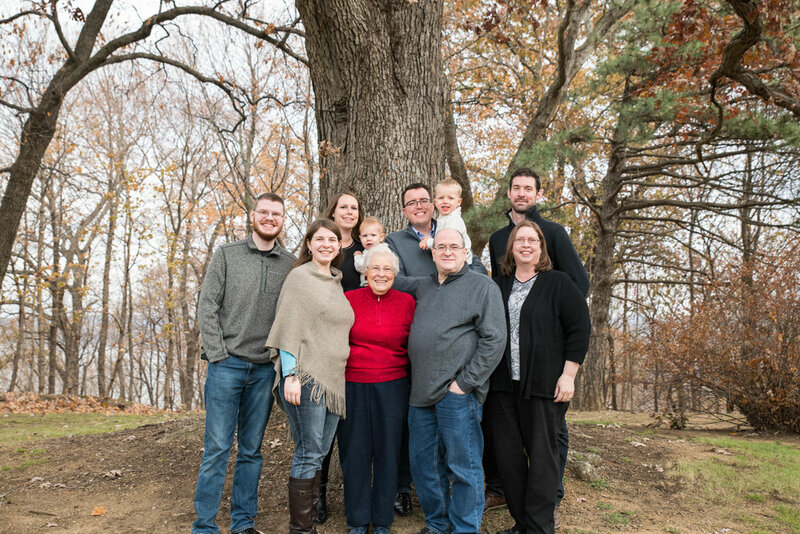 It was time for a special family photo and Kathy was able to not only get her immediate family together, but also her extend family together. I know her daughter and son-in-law, Ryan and Sarah through Lincoln Christian University as well as PCC (small world, let me tell ya!). It was wonderful to see them and meet their entire family. Not to mention, one of Sarah’s cousins married someone I used to work with at Camp MANY years ago. So many cool connections with this family and we had so much fun on this chilly November morning.